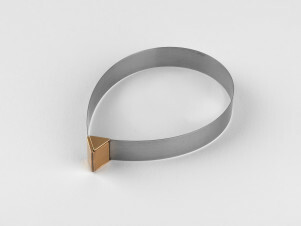 Two strips of sprung steel of different lengths forming two parallel bands when the bracelet is closed, with a steel catch fitted with an 18ct gold box cover. The catch is fabricated, consisting of two interlocking triangular pieces and soldered to either side of the sprung steel band. Grooves were cut into the inner sides of the bronze parts, the steel band slid into it, left protruding, soldered from the end and cut off after the soldering operation. 18ct yellow solder for the bronze parts. Easy silver solder for soldering steel and bronze together. 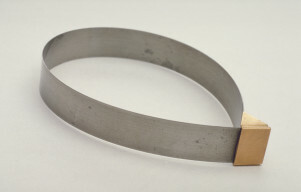 Bracelet, Elisabeth Holder, 1980, Crafts Council Collection: J144.